Britain's space agency has written to 13 firms to remind them that they need security authorisation to engage in any future contracts on the sat-nav system. The European Commission says Brexit means the UK will have to be excluded from a key element of the system after March next year. This is the Public Regulated Service, or PRS - a navigation and timing signal intended for use by government agencies, armed forces and "blue light" services. Brussels says London cannot immediately have access to it when the UK leaves the European bloc because it will become a foreign entity. PRS is for EU member states only. Can the UK go it alone on a sat-nav scheme? London's dismay at being shut out of a system it helped develop has been to raise the prospect of withdrawing from Galileo completely, and to consider starting up its own indigenous sat-nav network. Such a move could slow the development of Galileo - which is not yet complete - and increase its costs. Monday's letter is a further shot across the bows. By reminding British companies that they need the express security clearance from ministers to engage in new contracts, London is essentially saying to Brussels that it has the power to stop those companies from handing over technical knowledge on PRS to firms in the EU-27. Such transfers would be done under contract. 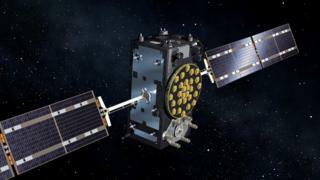 "We have written to all UK companies currently authorised to work on the secure elements of Galileo, asking them to consult us before taking on future contracts relating to the design and development of the programme and its encrypted service," a UK Space Agency spokesman said. "This is a necessary consequence of the European Commission’s position to exclude UK industry from the project on the suggestion of security concerns, which the UK Government strongly disagrees with. "The UK Space Agency is leading the work to develop options for a British alternative to Galileo, to guarantee our satellite positioning, navigation and timing needs are met in the future." The EU's chief Brexit negotiator, Michel Barnier, reiterated on Monday the bloc's view that the UK was locking itself out of Galileo PRS by walking out of the EU. "Third countries and their companies cannot participate in the development of security-sensitive matters," he told an event in Brussels. "These rules will not prevent the UK as a third country from using the encrypted signal of Galileo providing that the relevant agreements between the EU and the UK are in place." Merely having access to PRS at some future date (as has been requested by other nations outside the EU, eg Norway and the US) will not be good enough for London. It wants British companies to continue to participate in all aspects of the development and build of Galileo. Major contributions have been made by: Surrey Satellite Technology Limited (SSTL), which has prepared the navigation payloads on every operational satellite in the sky; the UK arm of Airbus, which controls the satellites at its centre in Portsmouth: and CGI (formerly Logica), which has been instrumental in designing PRS itself.